The belief in Biblical creationism, and in particular the belief that the earth is 6000-10,000 years old is ridiculed by the news, educational programming, and popular culture. Examples of anticreation in popular culture can be found in shows like The Simpsons, The Sopranos, Family Guy, and South Park, where creationism is portrayed as a belief that is only held by people unable to think for themselves. In The Simpsons, there is an episode where the character Ned Flanders, a devout Christian, enters a museum of natural science, and he is shocked to see that they are promoting evolution. He then sees a display labeled "the indisputable fossil record". Ned hides his sons' eyes from it and attempts to drag them out of the museum, and later complains to Rev. Lovejoy about the museum. This episode attempts to present the fossil record as "indisputable" proof of evolution, even though it does not contain transitional forms, and thus provides no evidence for evolution. It also portrays creation science as simply the belief that "God created". In reality, creation scientists engage in testable, observable, and repeatable science, while approaching their work from the belief that God created the universe. Creationism itself, like evolution, cannot be proven or disproven by science. Because God does not engage in acts of creation anymore, the act of universal creation is untestable. 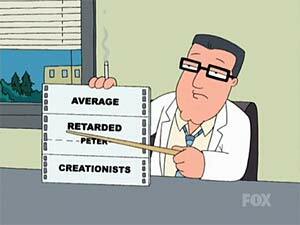 On Family Guy, creation science is again portrayed simply as the belief that "God created". Peter Griffin mocks believers in creationism or Intelligent Design by implying that they do not understand the claims made by evolutionists. Specifically, he says that they think the Theory of Evolution is "an individual organism that gets better and better". Both creationists and evolutionists agree with a "change in allele frequency" over successive generations; to say that creationists disagree with this is a stretch of imagination. Where creationists and evolutionists disagree is that evolutionists believe that mutations, which distort genetic information, are responsible for the diversity found between all lifeforms. Creationists counter this claim by pointing out that all mutations that have been studied to date have been found to decrease functional genetic information. In an episode of the gangster series The Sopranos, mob boss Tony Soprano is in the hospital recovering from a gunshot wound, where he is visited by a young evangelical minister. The minister is portrayed as an ignorant fool; he uses a dinosaur book that Tony had to try to explain that dinosaurs didn't live millions of years ago because "the Bible says that just isn't true." Tony asks him how Adam and Eve could have lived in the Garden of Eden with a carnivorous tyrannosaurus, and instead of explaining that tyrannosaurs would have been vegetarians back then, instead gives him a book and leaves. The show attempts to indoctrinate viewers with the idea that all evangelicals are irrational and ignorant, and furthermore that they are incapable of debate. Tony then talks with an atheistic engineer, and the engineer (of course) is portrayed as rational and scientific, and convinces Tony that all things are connected and that everything creationism proposes is false. Tony wants to hear more, but the engineer is going in for surgery to have his larynx (voice box) removed; a metaphor on the part of the writers to demonstrate how the voice of "reason" is being silenced in today's culture, which is an obvious contradiction to the reality that evolution is supported by many, whereas creationism is the belief that is suppressed. In an episode of South Park, a teacher refuses to teach evolution, but is eventually forced to, and so ridicules the belief. Richard Dawkins later makes an appearance in the episode. The Media Assault on American Values by Culture and Media Institute. This page was last modified on 31 August 2018, at 08:45.